If you’re a regular in the gym or you consistently pound the pavement you’ve probably gone through phases when you were extremely bored with your fitness routine. There comes a point in when it’s time for something different – and battle ropes are something different indeed !! Adding variety to your workouts is an excellent way to burn extra calories as your body is forced to adjust to something new. Next time you’re looking for a change, pop to see to your local fitness coach or personal trainer and you will discover the battle ropes workout. This unconventional training technique will not only restore life to your workouts, but it’ll also shock different muscles into action. 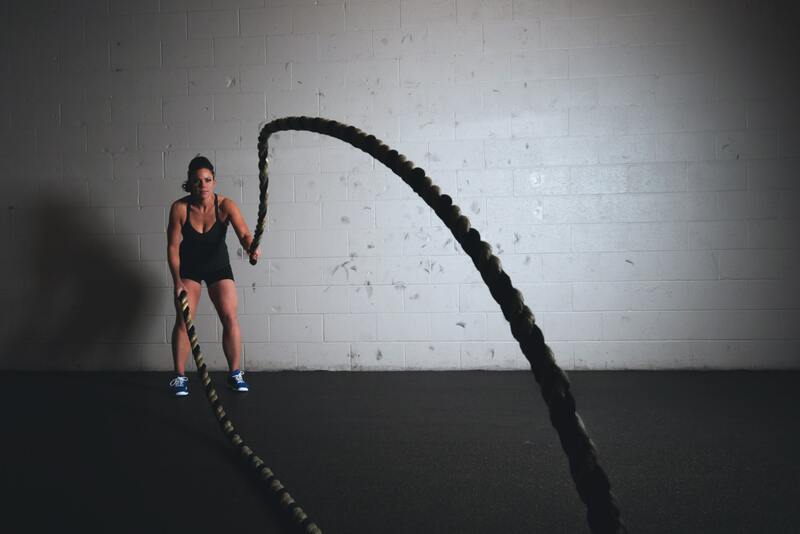 Originally developed for specific combat sports such as football and Mixed Martial Arts, battle rope training is a fairly new craze in fitness training. It involves lugging huge lengths of shipping rope and performing whipping motions (waves) or dragging the ropes around. Along with increasing your strength, power and endurance, the constant motion of rope battling will floor you with a muscle-toning, metabolic workout unlike any other. Training with battle ropes is a great way to develop upper body strength and coordination. If you’re looking for a highly effective, back-to-basics type of conditioning that brings a new twist to your fitness routine, this is it. You’ll be surprised at how fast a few quick whips can get you to your maximum heart rate. And its awesome fun. A battle rope is simply a length of industrial strength rope. Typically they are 10-15m long and approximately 5cm thick weighing up to 20kg. You’d be forgiven for thinking that some scrupulous personal trainer had raided a shipping dock in the dark of night and snatched the rope right off a ferry!! Exercises are usually performed with the workout ropes attached to a secure anchor point at one end. The rope is then stretched out and held at the other end. Battle ropes exercises are then performed by lifting the end of the rope and whipping it and producing a wave in the outstretched length. The goal is to maintain waves in the rope applying the principles of interval training. There are lots of pulse-pounding, heavy rope exercises to ramp up your cardio and build your core strength. Common movements include waves, slams, throws, spirals and whips. All involve swinging your arms up and down (or side to side) in some manner for timed intervals. To maximize your efforts, focus on maintaining the intensity of the motion from start to finish, no matter how much it burns. Performing battle ropes exercises over an interval produces a very intense workout. You’re aiming to maintain maximum force and speed for as long as possible or until the next rest period starts. As with all high-intensity interval training (HIIT) battle ropes exercises burn fat fast and produces a rapid rise in your body’s metabolic activity. It also produces great strength gains and is an awesome overall fitness activity. Start out doing 3 sets of 30-second intervals with 45 seconds of rest in between. As you get stronger and your conditioning improves, you can increase the duration of the move and decrease the rest times. With each of these exercises, you want to create a solid base by planting your feet in a shoulder width stance and stabilizing your core. You’ll quickly discover that these exercises engage not just your arms and shoulders, but your whole body. The battle ropes workout is a safe, low impact training method that focuses on the muscular system while putting only a small amount of stress on your joints. It’s also the kind of resistance apparatus you can safely drop when you reach your limit. It burns fat as effectively as sprinting HIIT and heavy resistance workouts. You’ll also get a fantastic core workout from your knees to your chest because of the need to stabilise yourself as you create the waves. The battle ropes workout is hard, but lots of fun. It can help you to improve your athletic performance because it works the neuromuscular system from your core out to your extremities. It is also effective in giving participants functional strength, particularly by improving your grip and strengthening your shoulders. And psychologically… as with any kind of ‘good pain’ you force yourself to endure, it’s going to give you the power to overcome all kinds of obstacles in your life. If you fancy trying out some battle ropes workouts give me a shout.